Do you have discomfort in your ankles? Do you feet fall asleep when you ride for long periods of time? Do you have trouble getting your heels down? Do you push your feet out in front of you? 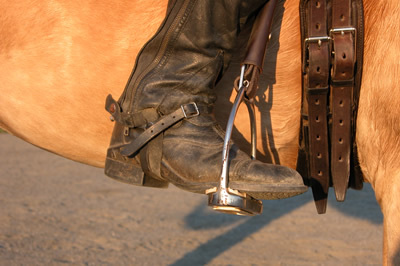 All of these common riding problems may be due to your ankle alignment. Your ankles and feet are made up of 26 different bones. I am going to limit this Minute to the ankle area only. In future Minutes I will discuss other parts of your feet. Your lower leg is comprised of two bones, the tibia (shin bone) and fibula. These two bones rest on the talus (the actual ankle bone), which along with calcaneous make up your ankle joint. You can imagine where the talus is by feeling the ends of tibia and fibula. Photo 2.The ankle is jammed down an in, putting a lot of weight in the stirrup. Notice the twist in the stirrup leather. 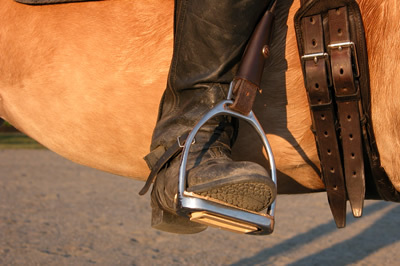 As a result the stirrup is no longer perpendicular to the horse and the rider’s foot has turned out. While the heel may appear lower there is little flexibility remaining in the ankle joint to absorb the horse’s movement. Run your hand down your lower leg. Just before the leg joins the foot you will feel two large bumps, what we often think of as our anklebones. These bumps (maleoli) are actually the ends of tibia (on the inside) and fibula (on the outside). The talus itself is difficult to feel because it is under and between the maleoli. Imagine where the talus is as you feel the maleoli of tibia and fibula bones. Photo 3. The ankle is cocked out. Notice the increased pressure on the pinky toe. 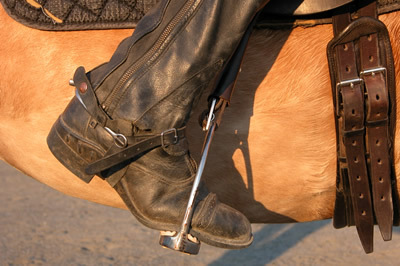 The ankle joint cannot flex in this position, therefore the rider’s heel has come up. Below talus is calcaneous, your heel bone. Talus rests on only the forward portion of calcaneous, part of which projects back forming our heel. Take hold of your ankle with one hand on each side below the ends of tibia and fibula and place the other hand on your heel. Move your ankle from side to side and circularly. Sense and feel the movement in your ankle joint. If you can rotate you ankle then you have plenty of flexibility to get your heels down where they belong.In the horse the equivalent to our ankle joint is a portion of the horse’s hock. Unlike us, there is only one bone meeting the anklebone or talus in the horse. The tibia, the large bone between the stifle and the hock in the gaskin region or lower portion of the horse’s thigh, joins the talus by itself. The fibula has faded to a mere sliver of a bone and ending about halfway down the tibia. When riding you want ankles in a similar alignment to when you are standing so that you don’t stress the ankle joint and surrounding ligaments. Gently experiment by walking with your ankles cocked in or rolled out. Be careful! You wouldn’t want to twist your ankle. So next time you experience pain in your ankles or your leg position seems insecure, check the alignment of your ankles. Use this Murdoch Minute as a ‘body position self-check’. A solid base is especially important when riding. The ankles form a significant portion of your base of support. When the ankles are well aligned the ankle joint will be able to flex allowing your heel to deepen without jamming your foot forward or down against the stirrup. Hopefully this Minute will help you get your heels down without pain. And always remember – enjoy the ride! Wendy Murdoch resides in Washington, VA and is an international riding instructor/clinician. She travels worldwide teaching riders of all levels and disciplines how to improve the horse’s performance by improving their body position.